Are the Italians Getting Tired of Francis? 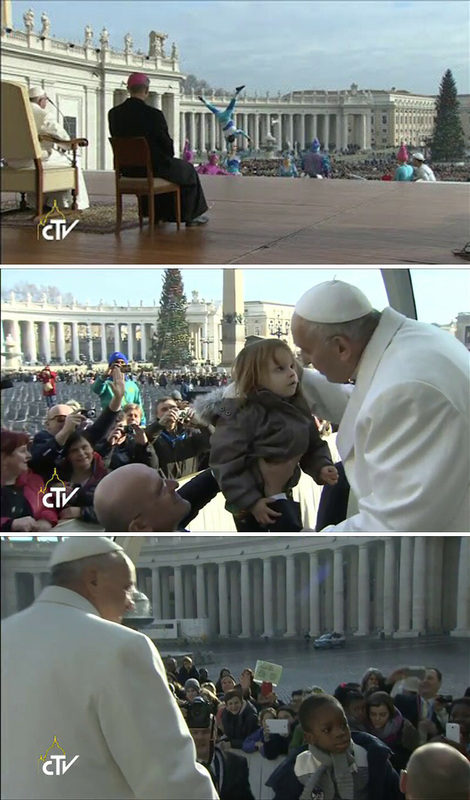 The photos on this page were taken in the last three years of Francis' pontificate in the winter season, as can be noted by the presence of the Christmas Tree close to the central obelisk in St. Peter's Square. During this time of the year, since it is cold and near Christmas, there are fewer pilgrims in Rome. The majority of the people present at the General Audiences and Angelus addresses of Pope Francis normally are Italian Catholics, most of them Romans. 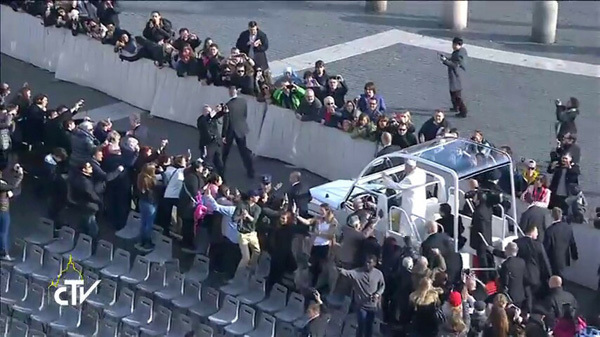 Above, we see how meager of late the crowd had become – if we can use this word to signify the barely three layers of persons on either side of his popemobile. This picture shows the Pope passing by the obelisk, whose stone posts of the circle surrounding it can be seen in the top right. Now, let us compare this scene with photos from the previous years of Bergoglio's pontificate. The first three rows below show Angelus addresses or General Audiences of the years 2013, 2014 & 2015 respectively. The three last rows picture Audiences at the end of 2015 and the beginning of 2016. We see that there is a remarkable decline in attendance. 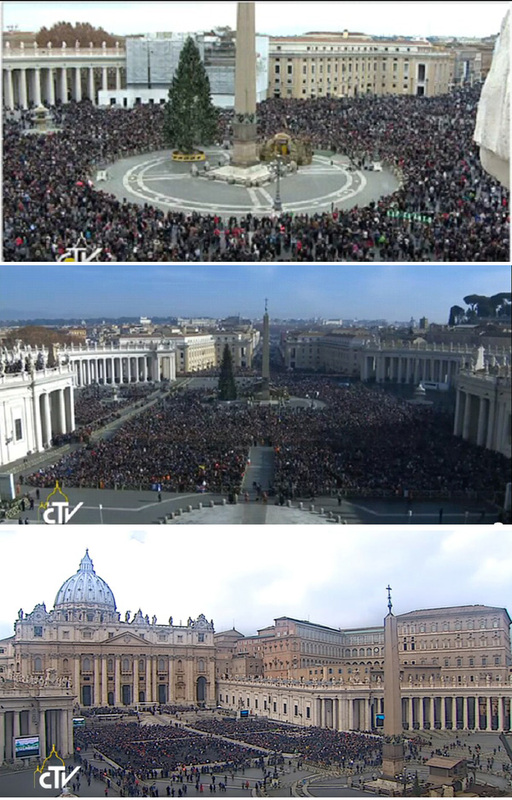 In 2013, in the first picture below, the crowd fills St. Peter's Square and overflows into the Via della Conciliazione. In 2014, second row, the Square is no longer jam-packed but the crowd still fills about two-thirds of it. In 2015, third row, the whole circle surrounded by the Colonnato di Bernini is empty. Only the four sections closer to the Basilica, marked off for pilgrims have people standing and one of them is half empty. If we have an open space without chairs, more people can gather there; when we put chairs in that space, there is room for less people but it still looks filled. Vatican officials recently placed chairs in those four sections. With this they tried to fill the increasingly empty space and cover for this obvious decline of audience at Francis' appearances. Before, the people stood in those sections; the only areas with chairs were the two small ones on either side of the papal stage. We can see that the artifice did not work, since now even the chairs are not being filled, fifth row. When the monarchies were still setting the tone for the world, there was a saying: “The silence of the people is a lesson for the King.” Then, there were no polling institutes to check public opinion. If the people were silent when the King passed by, it was a sign that they did not like him or did not approve of what he was doing. The King should understand the censure and reform his behavior accordingly. Can we not say today, paraphrasing: “The absence of Italians in St. Peter's Square is a lesson for the Pope”? Francis Finds the ‘Tiara’ for the Conciliar Church?